Nordic Ware's braiser pan is designed for the hearty comfort foods that are regaining their popularity today and is perfect for sautéing or browning vegetables, poultry, beef, fish, and other foods, before covering to simmer on top of the stove, or in the oven. 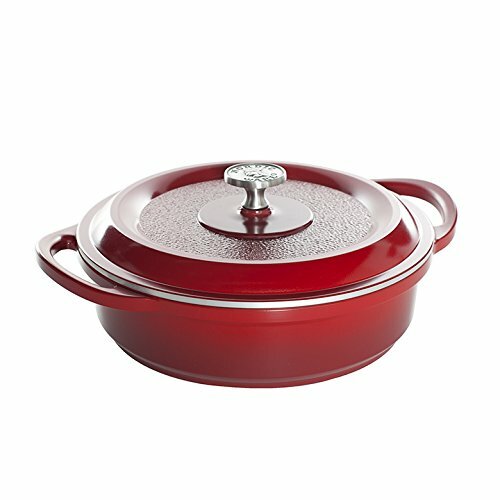 The Pro Cast Traditions Cookware Collection is made from pressure cast aluminum which offers unsurpassed cooking performance due to its excellent heat conduction properties. Cast aluminum is regarded by chefs around the world as the material of choice for even temperatures, controlled cooking, and rock solid durability. Cast aluminum is half the weight of cast iron and the enamel finish won't chip or rust like porcelain cast iron products. The texture-infused nonstick coating makes for easy clean up and eliminates the need to season the pan before you use it. The air-cushion bottom provides increased air circulation for improved heat distribution which means better, more even, cooking results for you. The handles are oven-safe, so you can use the bakeware on the stove and in the oven. Made in USA with imported knob.